Simply shrink videos to save disk space. Download now for free! Your storage is almost full or you want to reduce the size of a video to send it with Whatsapp, iMessage, or post it on Facebook or Instagram? This app will solve your problem. - If you like, the app can also delete the original video for you (requires at least iOS 8) so that only the compressed ones will be kept. Please note that deleted videos may still appear in the album "Recently Deleted". Delete them as well to save disk space. 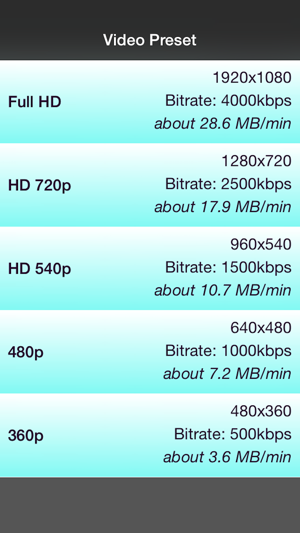 In addition to that you can also specify the bitrate to compress your videos. The app shows you the new memory space of the compressed video. Also you have a video preview to check the image quality. Download now for free and save storage on your device! 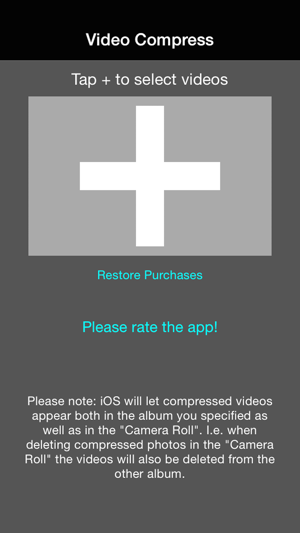 Please note: iOS will let compressed videos appear both in the album you specified as well as in the "Camera Roll". I.e. when deleting the new compressed videos in the "Camera Roll" the video will also be deleted from the other album. The app was made to compress original videos that had been recorded with the original camera app of your iPhone/iPad and may not be able to compress videos from other sources or videos that had previously been edited. Please don't select too many videos at once. I love this app. Help me compress videos and keep the quality on HD 1080p videos before I upload them to dropbox or iMessage them to someone. You can convert HD 1080 P to a compressed HD 1080p, 720p or 480p and it lets you adjust how much bit rate quality you want to lose. If I leave it at its default compression and same 1:1 resolution, it will shrink the files to 1/3 of their size and I don’t notice a quality loss at all. I only wish I could convert 4K to a compressed 4K. Right now the maximum compressed output size it can create from a 4K file is 1080p. It would be great if they could update the app to compress into a compressed 4K size as well. I understand why they don’t, because you can set an iPhone 8 or higher to use the new Apple built in compression, But there are times I feel my 4K file and forget to set the camera to use Apples compression and would like to convert it afterwards. I paid $4.99 for the upgrade because the app was useless without it. Then I paid $0.99 to get rid of the ads. A few minutes later the app stopped working. I would choose a video to compress then it would “compress” it but the newly compressed video would not show up anywhere in my camera roll or in the album I selected. After 4 more failed attempts I deleted the app and downloaded it again, hoping to give it a chance to refresh or restart. Just like the first time, it tried to charge me $4.99 in order to compress even a small video. And I would have had to pay $0.99 again to make the ads go away. Really??? Seems like a total scam to me. I gave it 2 stars because the five videos I compressed before it stopped working turned out great. But I’ve never been so disappointed with a purchase on the App Store before. I want my money back. We are shooting videos that are good enough for the big screen but also so big you can't message or email them. Even one step down to 720P reduces the file to maybe 1/5th yet is totally sharp. Crunch it even more for mobile no problem. Also good for making more room on your drive. Of course anything super important should be downloaded to your computer full size. It's free but I will gladly pay the $.99 to get rid of the ads and put the money in the pockets of the creators.